The combat system for my Stonehell Dark Souls game has drifted steadily away from traditional monster attack rolls toward monological combat (in short, players always roll, similar to Apocalypse World and Numenera). Brief recap. 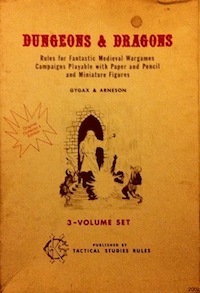 In the initial December formulation, players chose between blocking or dodging (resolved using ability checks but also risking running out of stamina) or having the ref make a traditional monster attack roll versus character armor class. 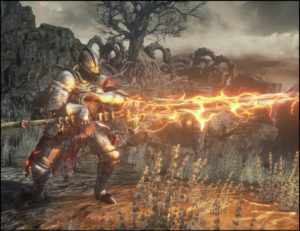 The trade-off was between relying entirely on ability scores or pitting character armor class against a monster’s potentially high attack bonus. Making rules stick. 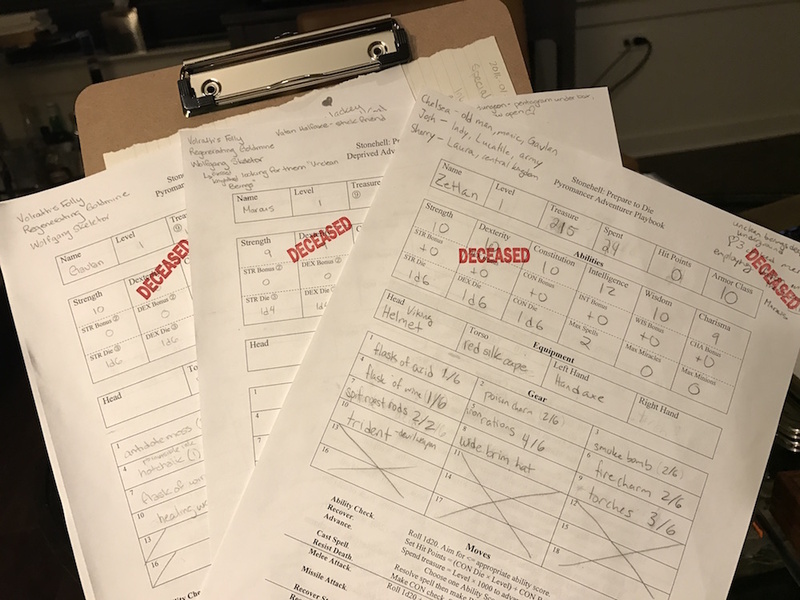 In the past, I have sometimes had trouble getting combat house rules to stick because it is so easy to fall back on a familiar procedure, even when new rules result in more engaging outcomes and are advantageous to players. However, from the start of experimenting with the Dark Souls inspired active defense options, and across several groups of players with varying levels of tabletop roleplaying game experience, the active defenses seemed to remain top of mind. During the most recent session, players only ever defended actively, never letting the monsters make attack rolls, even with the risk of running out of stamina, which is punishing. I draw several lessons from this experience. Choice prompts. First, the explicit choice prompt is an effective and low-maintenance way of communicating formal rules without needing non-referee players to read any rules (“zero homework” requirement). This is huge. Making such prompts habitual . This does place some constraints on potential rules, since the procedure must be fluent enough to survive being deployed all the time. That opposes complexity bloat which is positive more often than not. Active options. Second, active options, assuming equal player effort requirements, have an advantage over passive options (such as submitting to a monster attack roll). Risking overgeneralization, I suspect this is universally true because players prefer a sense of control keeping all other factors constant. Proposal. What follows is the procedure I am now considering, with parts that have not been play-tested in bold. Previously, armor class was a traditional passive defense score, but the approach below requires damage-reducing armor. Determine actions for each monster. Match groups of monsters with defenders. Resolve as specified below or by using the most relevant ability check. Fight off. To defend using a melee weapon, roll the weapon’s damage and add the result to armor rating this turn, then suffer monster damage. In effect, this defends by comparing damage potential between player character and monster. Shield block. To defend using a shield, make STR check (success → suffer no damage, failure → suffer ½ damage) and CON check (failure → out of stamina). Dodge. To avoid monster attacks, make DEX check (success → suffer no damage, failure → suffer monster damage) and CON check (failure → out of stamina). Add the damage from all monsters threatening a player character together, subtract armor rating from the total, and then suffer this amount of damage. The fighting off procedure uses one roll per adventurer no matter the number of monsters. This means that the fight off option is more easily overwhelmed by multiple monsters, since the player character damage roll opposes multiple monster damage rolls added together. Not needing to make tons of attack rolls for a host of enemies is a nice added bonus. To simplify presentation for this post, I left out one small step, where player characters can intercede to block for an ally assuming the positioning makes sense fictionally. This can happen during the matching of monsters with defenders (step 2). This entry was posted in Rules and tagged combat, Dark Souls, Hexagram, Stonehell on January 15, 2017 by Necropraxis. Great work! Looking forward to testing this in my D&D game. I think certain character builds would essentially reduce these three choices down to a single ‘defense’ that the PC would choose every time – thus you really haven’t given them an option at all. For example: people who don’t have shields will automatically be reduced to 2 options. People with lousy weapon damage (mages/rogues/etc) will never choose ‘Fight Off’. People with high armor/weapon damage (fighters) will always choose ‘fight off’. I think the ‘Fight Off’ option might be abused in certain circumstances: for example, a highly armored Fighter with a 2-Handed sword, fending off tiny Kobolds. Without any kind of roll on the fighter’s part, he knows his armor + minimum damage is greater than the Kobold’s damage, and thus he would never get hit (especially if he puts his back against a wall and only 2-3 Kobolds can attack at any one time). I do agree that players love monological (reaction-based) combat where they get to do the rolling. Anything that breaks the “you hit. they hit. you hit” monotony is great. I like that Dungeon World allows characters to be ‘descriptive’ about all kinds of different defenses they can employ, but mechanically they are all resolved the same way (for ease of learning the rules).